The correct identification of skin types and conditions is key for successfully selecting effective skincare products. For example, in many cases you can have a combination of skin types, such as an oily T-zone and normal around the cheeks. You often hear "I have very oily skin but it's also very dry"... while the skin is an oily type, this dryness is usually referred to as dehydration. Dehydration is a skin condition due to lack of water moisture rather than oil. It's important to remember that skin needs both oil and water, so even if you have oily skin you need to use a moisturiser. What are the 5 common skin types? Normal skin looks soft, moist, plump, dewy and has a healthy glow and colour. It's fine textured and there are no visible wrinkles, lines or open pores. Ageing due to the passage of time, sun exposure and other external elements such as harsh climate, dehydration and poor care are the primary factors that cause deterioration of normal skin. Other factors include insufficient water intake and inadequate diet. The use of harsh skincare products like soaps and scrubs and lack of cleansing, sun exposure and exposure to the elements without protection dries, dehydrates and ages skin. Normal skin requires proper morning and evening cleansing and protection from oxidation caused by free radicals. The consistent use of protective moisturisers during the day to prevent moisture loss and hydrating creams at night is essential. It's important that these moisturisers contain antioxidants such as Vitamin C & E , idebenone or coenzyme Q10. An exfoliating product is also beneficial. Sun protection is extemely important, even for children. For normal skin the key is damage prevention. Oily skin is classified by the over production of sebum (oil). 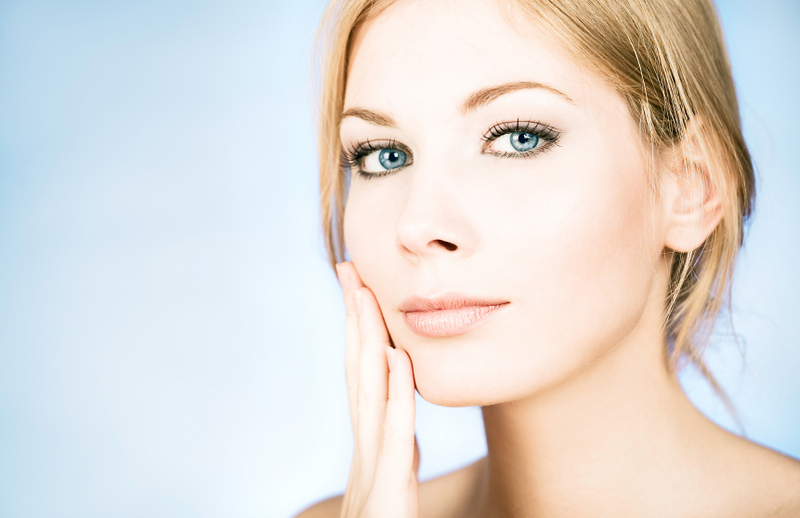 Oily skin can be recognised by its shiny, thick and firm appearance. Pores look enlarged, usually due to oil entrapped in the follicle. Hot and humid climates tend to exacerbate oil gland secretion making the skin more oily. Oily skin problems can be aggravated by the misuse of skincare products and the tendency to dry the skin either through the use of harsh soaps or excessive use of astringents or scrubs. Oily skin can be classified into 2 subcategories oily (without water deficiency) and oily dehydrated - lacks moisture (with water deficiency). Often those with oily skin tend to use drying, dehydrating ingredients in an effort to feel "less oily". The end result is skin that feels flaky, rough and scaly so clients go on to use very rich skin products as they believe their skin is dry. So as the skin already has enough oil, the products aggravate the oily condition and result in blemishes or blackheads. Care of oily skin requires thorough yet gentle cleansing, morning and evening. Daytime protective moisturisers will help the skin maintain its suppleness, moisture and protection. Night creams gel or lotions should help regulate oil gland secretion. It's important to keep oily skin hydrated. Daily exfoliating ingredients, such as AHAs or BHAs are highly recommended to improve the look and texture of the skin by removing the dead skin cells and they have anti-inflammatory and anti-bacterial benefits too. Dry skin develops as a result of under-active sebaceous glands. Dry skin, while hereditary like oily skin is also a result of ageing. As all body activities slow down with time, oil gland activity slows as well. The skin cells also divide more slowly and the skin thins and takes longer to repair. Dry skin tends to be dehydrated. It can feel scaly, rough and itchy and is aggravated by exposure to the sun, wind, heat and the wrong skincare products. What are the right products for dry skin? They need to stimulate the skin functions (with exfoliating ingredients), activate oil gland secretion and provide deep hydration. Moisturisers that can form a film on the skin to protect, prevent or reduce moisture loss (such as hyaluronic acid) are best. Other moisturising ingredients are also essential to activate the skin's natural water retention ability and to place additional moisture into the skin. These ingredients include glycolic acid and lactic acid, glycerin, urea, ceramides and cholesterol. Combination skin tends to have either normal cheeks and an oily T-zone; or dry cheeks and a normal T-zone. The skin cannot be dry and oily at the same time. The skin does not tend to be that extreme within such a small space. Usually when the skin is classified as dry and oily, it's oily or oily and normal dehydrated. Dehydrated skin is different from dry skin, which is a condition brought on by impairment of the outer layers due to factors such as decades of unprotected sun exposure, genetics or skin disorders (like eczema). Dehydration is a lack of sufficient moisture in the cellular system and intercellular channels - dehydration is caused by the compromised permeability of the lipid barrier. Dehydrated skin looks dry, scaly and flaky. It feels tight. This can be caused by many factors, such as not drinking enough water, the environment, hot, cold, heating, air conditioning and wind. Care for dehydrated skin requiries the use of moisturisers containing ingredients that will protect the skin from moisture loss as well as restore internal skin hydration, for example hyaluronic acid and natural humectants such as glycerin. In order to restore or improve the skin's lipid barrier, ingredients such as ceramides, cholesterol and fatty acids are essential. With sensitive skin, the skin readily experiences adverse reactions or unwanted changes in response to external factors, such as cosmetics. Skin sensitivity can be experienced as inflammation, redness, tightness, itching, burning, spots, flaking, scaly patches, bumps etc. It's important to distinguish between reactive skin and sensitive skin. With reactive skin the same product or ingredients will not react in the same way each and every time it's used. Where sensitive skin reacts in the same way every time, each time a specific ingredient or product is applied. Ingredients that can often cause sensitivity are fragrances, preservatives and some chemical sunscreens. Go for fragrant free and gentle skincare products that contain anti-inflammatory and anti irritation ingredients.